I've always loved tactics, strategy and everything involved in the conducting and winning of wars. During Highschool I played Mil-Sim airsoft in order to satiate that thirst. Due to the time involved, and the lack of any friends in that hobby I haven't played in around four or five years. Despite that, I have always love playing strategy games on PC. Games such as Xcom, Dawn of War, and Wargame always provided me with some of what I craved. The Dawn of War series first introduced me to the world of Warhammer in 2009, but it wouldn't be until 2014 when I had enough money to start playing table top. I think 40k has its problems like any other game, but there is one problem that a narrative approach can fix. Narrative wargaming gives both a story telling background and a strategical context for the tactical battles that we wage on the table top. It should be rare for a tank company to attempt to traverse dense terrain, for if they should attempt such an endeavor they should not go unpunished if they do not bring in infantry support. The orcs attempt to cross the river had failed, as evidenced by the large pile of warm bodies strewn in front of the gatehouse. Blood and entrails streaked all across the broken gate. Only a few, grim men stood before and atop it, exhausted due to the exertion of the morning’s bloody work. Atop the gatehouse Corunir, Tarandir, and Folco the Hobbit, looked on with a relieved satisfaction. Below Brognir and his men stood vigilantly at the gate they had fought so hard to protect. Despite their attempt, none of them could have been described as fearsome in that moment. They were tired, bloodied and battered men. If another group of orcs wished to challenge them they would all haven fallen due to exhaustion. Thankfully however the rest of the garrison came to relieve them. Amdir was with them, but unlike the rest of the garrison, he and his men were just as bloody and exhausted as they were. They walked on up to the gate and greeted one another, happy in their victory. When they all had reunited near the gate each man began to tell the other of his part in the battle. Corunir told of his and folco’s prowess with the bow, and of Tarandir’s melee with the orcs atop the wall. Brognir tersely told of his defense at the gate. Amdir told of his duels with deadly orcish infiltrators in the houses and streets of the city. As each man had told of his deeds in the battle they began to speak of their parts in the war altogether. From their trip to Mirkwood, their flight from the Trollshaws, and the battle of the Hoarwell, each man and hobbit, had grown along the way, but they were not done growing yet. They had fought and traversed through so much, all for a single purpose. To keep the green things growing, the children laughing and the people smiling. . It was then that each of them slowly began to realize one last part about themselves as well. That they did not love the bright sword for its sharpness, nor the arrow for its swiftness, nor the warrior for his glory. They loved only that which they had defended. Whether out of desperation or greed, war often turns men and orcs into scavengers and vultures. As your battle company is surveying the aftermath of the battle for the Hoarwell, they come across a group of scavengers attempting to profit from the lawlessness. They seek to stop you from taking their ill gotten gains and attack you without warning. Your battle company will be facing Twice as many Scavengers as there are members of your battle company. They may be represented as either orcs or men. Scavengers are strength 3, fight 3, armor 3, attack 1, courage 2, hand weapon equipped models. In addition to the scavengers there will also be a scavenger’s leader. He is a strength 4, armor 5, fight 4, attack 2, 1 might, 1 will, 1 fate, model. He is equipped with a 2handed sword, and a concealing cloak. Naive confidence: All bandits are immune from morale checks as long as their leader is still alive. 6 The model that slew the bandit leader may choose to increase their fight/strength/defense/attacks as if they had rolled on the progression chart. It had been over a year since the rangers set off on their quest toward Mirkwood. The rangers had found the source from which all of the evil had been stemming from on their journey. However they were unable to warn their comrades in Eriador before it was too late. The orcs had already passed over the mountains and were making their way toward the ranger’s hidden strongholds. A series of frantic battles broke out across the Troll Shaws as the Rangers attempted to escape the rampaging hordes. With the help of Tarandir and his company along with a contingent of Gondorian allies, the rangers were able to successfully disengage from their holds and cull the hordes of orcs. While the rangers were able to escape the hordes, they had to retreat across the Hoarwell. The river proved to be a valuable defensive asset letting neither side cross its frothy banks. Each side would probe and skirmish the other in an attempt to find a weak point in the others defenses. None could find a weakness in the other. After nearly a year fighting along the banks, in his impatience, the Dark Master unleashed his hoards on the last bride in a brute force attack. Many orcs tried to swim across and drowned, while others tried to cross the bridge and were beaten back. Unfortunately in the midst of the chaos some orcs were able to cross the river; however with the sheer losses the orcs suffered they were not able to capitalize on their advances. While successful in their defense, the Rangers were not able to capitalize on their victory either as they had to chase down the orcs that did make it across. The stalemate over the Hoarwell would continue until either side made a decisive move. Amdir, son of Garafon, has since made a name for himself amongst the rangers for his prowess in combat, first for slaying a troll and now for slaying a great deal of orcs. Tarandir has proven his tactical aptitude again and again leading the company to many victories. Folco, a curious little hobbit has been in the company and surprisingly proved courageous and capable in battle. Whether out of desperation or greed, war often turns men into bandits and thieves. As your battle company is patrolling the Swanfleet, they come across a group of scavengers attempting to profit from the lawlessness. They seek to stop you from taking their ill gotten gains and attack you without warning. Your battle company will be facing 19 bandits. Bandits are strength 3, fight 3, armor 3, attack 1, courage 2, sword equipped models. In addition to the 19 bandits there will also be a bandit leader. He is a strength 4, armor 5, fight 5, attack 2, model, 1 might, 1 will, 1 fate, model. He is equipped with a 2handed sword, and a concealing cloak. With the ranger’s retreat from the Trollshaws, the denizens that were once controlled are now free to their own devices. Many strange unions are sure to be made in the midst of the power rift. As your battle company is patrolling in the area you hear the sound of discordant instruments and tone deaf singing. When your company finds the source of the terrible music they are astonished to find two trolls with wreaths of flowers on their heads and many treasures on a table nearby. Accompanying them are several orc servants, roasting meals and pampering the two trolls. The enemy warband consists of 2 cave trolls and 5 mordor orcs. Slavish servants: when one troll is dead the orcs must make courage tests. If both are dead any orcs still left must flee. Victory is achieved when there are no enemies left on the board. 2 Wedding Feast: All warriors and heroes that were knocked out of action count as rolling a full recovery. Heroes that did not go out of action may heal one current injury. A great host of orcs and goblins have come down from the mountains and caught the free peoples unawares. They seek to venture further west and rain havoc on the innocent. The rangers have long held secret bases through which they have staged their opposition. The sudden attack has caught them by surprise and they must abandon their holds east of the Hoarwell. They have no time to prepare, but will try to take as much as they can with them. Will your battle company help them escape with their ancient treasures, or will you claim them for your dark masters? This battle will be fought between at least two good and two evil battle companies. Each player will add up their battle company’s score along with any extra troops or heroes they take with them for this battle. The total for each Battle Company and additional troops shall not exceed 300 points. If a player has a battle company that itself is worth more than 300 points he or she is unable to take any additional troops or heroes. For each pair of good and evil battle companies there will be one objective. Each objective represents the ancient relics that the free peoples are trying to move to safety. Each objective counts as a heavy object. The objective of the good battle companies is to get the relics off the board from any table edge. The evil objective is to seize the relics. The game ends either when all of the objectives have been taken off the table, or evil is in possession of all the objectives. The battlefield should represent what you want a ranger sanctuary to look like; however It should be a defensible position. In this case, the center of the board will have a tower on a hill surrounded by crumbling stone fences. Inside the tower is each of the objectives. The good forces will deploy within the perimeter of the stone fences, whilst the evil forces will deploy at least 8 inches away from the fence line. Starting on the 10th turn before priority has been rolled, any warrior lost by the evil forces may return from a random board edge using the reinforcement rules. Wailing, screaming and whimpering echoed throughout the eastern foothills of the Misty Mountains. The captured goblin was not one to suffer silently, as he made his pain known to all that could hear him. The company feared that the cacophonous wailing would draw all of the enemies east of the Misty Mountains to them. They tried beating him, but he only yelled more. They tried ignoring him, but he only called them by name. In a final attempt at silencing Gitnick, Corunir gave him food and loosened his bonds. Surprising this worked, but Brognir was not happy that the wants of an evil creature had been appeased. Gitnick transformed from a whimpering pitiful creature, to a servile simpleton. During this transformation, Gitnick repaid his captors for their mercy by giving them what they wanted. He began talking about a small unknown trail upon the edge of Mirkwood. He claimed that it would lead to the dark masters that were driving the orcs to the mountains. It took them two weeks to travel from the Misty Mountains to Mirkwood, however they did not yet enter, for the trail was further south. As they made their way south along the forests edge, the trees began to grow closer and closer together. Then when it seemed as if each tree was choking the other, a small partition appeared. The darkness of the path made it stand out amongst the many trees. Each member of the company entered the dark path one by one as it was not large enough to allow them to walk abreast one another. As they made their way through the trail a sense of dread crept up upon the company. It became darker and darker as they proceeded through. Gitnick, who had almost constantly made noise since his capture, was now quite. He began to say “It won’t be long until we meet the dark ones, they lie further down the path”. Brognir then took his spear to Gitnick’s throat , threatening him with death, and said “If you betray us, you betray your own life”. Gitnick replied “Me only showing nice rangers what they asked for, I no trick you. Me too dumb for that”. Brognir was however not convinced and made it his personal mission to make sure that the captive did nothing outside of his sight. That night they found a small clearing and made camp. Many hours went by underneath the darkness of the trees, but none could really tell when the night ended and the day began. When each had their rest they began treading down the path once more. Before long the path became cluttered with thick webs that could barely be cut through. When the webs became so thick that they could scarcely make their way through, Gitnick started yelling hysterically. Brognir tried to silence him, but before he could do anything large dark skittering shapes could be seen amongst the trees. Arrows sung forth from the rangers as they huddled together in a defensive circle. Large spiders hungry for fresh meet had the company. The spiders skittering between the trees made them hard to hit, and their ghoulish appearance made the hearts of the ranger’s race in terror. They began shooting their sticky webs incapacitating some of the rangers, but each of them fought on stabbing and slashing at the dark shapes as they lunged into the melee. Whenever a spider fell, another took its place. They would have to escape if they were to get out alive. One by one some of the rangers fell to the sticky embrace of the webs. The situation was looking dim, but out of nowhere arrows came out of the darkness pierced the spiders. Out of the darkness stepped a group of elves dressed in greens and browns. Each of them had a bow in their hands and a dagger at their side. As happy as the rangers were to see the elves, they did not appear so joyful. The elves looked upon them with disdain and clearly thought them fools for having needed rescuing. The elves said nothing, but pointed further down the path, seemingly knowing what the company sought. The engagement with the spiders and the visitation of the elves was so quick and chaotic that No one individual could really know everything that was going on. After all was said and done Gitnick could not be found, and had presumably escaped. Brognir felt personally responsible as he took the task upon himself to do correctly. He cursed himself and the slippery goblin, but could not allow himself to be overcome with guilt. Despite his failing, he pressed on as the company made its way down the path once again. So far the path had been dark due to the closeness of the trees, but now the trees themselves were different. They were gnarled, withered, and diseased specimens that somehow produced an even thicker layer of canopy. The degree of their sickliness became more pronounced as they made their way further and further into the darkness. When the trees became so sickly that none believed they still lived, a lone dark tower atop a bald hill could begin to be seen in the distance. Dark pillars of smoke, and moving throngs of small shapes could be seen emanating from the foreboding structure. The company stealthily made their way to the dark tower, creeping as quietly as possible. As they got closer, the shapes began to sharpen and turned into orcs, goblins and even swarthy looking men. Before the great host, was a group of nine darkly clad figures, all clad in the heaviest of armor. Where there should have been a face, there was nothing but a terrifying empty void that seemed to be sucking the light in from around it. They turned to the massed throngs and spoke in the blackest of tongues, and in response the masses rose up their blades and spilt their own blood for their new masters. In turn, each of the nine had a pouch that they gave to the leaders of the eclectic assembly. What the rangers could not understand in speech they could in action. These terrible figures were promising more than a simple pouch of gold, this was just a taste of what is to come. Quickly Tarandir had the company retreat and make their way back to the tower. The captain must know of the evil in Mirkwood. The trek through the wilds was a journey that the Company fared well in. After having fought the Uruk Hai and the troll, the path toward Rivendell was clear. It would still take the company of rangers another week to reach the hidden valley of Imladris. When they finally reached the vale, their hearts were renewed with vigor and hope. They were greeted by Elrond and given shelter in his Homely House. Each member of the company was given leave to wander and delight in the elvish paradise. Most sat in the hall of fire and enjoyed its warmth along with the songs and poetry of the elves. Others wandered about the beautiful valley from end to end, basking in its sight. As enjoyable and refreshing as Rivendell may have been, the mission to Mirkwood was still uncompleted. After three days of rest, the company was ready to go back on the road again. As they were preparing to leave, two fellow rangers in full battle gear approached the company. These two were not unfamiliar to the company, as they had conversed with them greatly during their time in Rivendell. They strode up to Tarandir and said “we wish to join you”. With a smile on his face and a pat on their backs Tarandir replied “we would be happy to have you”. Their names were Eradan and Calenor. With the coming of two new comrades, the company of seven became nine. The happiness that Eradan and Calenor’s coming was however short lived. The pass over the Redhorn gate is typically a treacherous one. The snow and rocks of the pass have proven in the past to be as deadly as any orc. To make matters worse the goblins of the misty mountains had been seen prowling about during the night, doing some unknown bidding for their dark masters. As the company climbed up the slopes of the Misty Mountains, the snow capped peak of Caradhras got closer and closer. Brognir began to speak of the mountain as it grew above them. “Elrond lost his wife atop this pass underneath the looming peak of that damnable mountain. It is said that orcs and goblins, otherwise afraid of the sun are given shelter from its rays by the shadow of Caradhras. Some say the mountain itself grew so that orcs may wander atop the world in defiance of the sun.” For indeed this seemed true as they made their way through the pass, the shadow of the mountain seemed to grow longer and longer. In the midst of the shadow, despite the darkness, something could be seen glittering resplendently. The company was drawn toward this light by their own curiosity. But as it turns out they were not the only ones to have been drawn toward the shining light. A group of Goblins began clamoring over the rocks and skittering toward it. Along with them was a cave troll. Shielded from the sun by the Mountain, it lumbered toward the small light. Quickly Tarandir shouted for Courinir to help him cover the right flank, along with Amdir and the two brothers. Eradan, Brognir, Calendor and Adenhad went up the middle. As the troll advanced, Tarandir and Corunir peppered it with arrows hurting it gravely. In fear it was driven back toward the other goblins. The three warriors were then free to move up and secure the source of the light. They were however too late, two goblins had already taken hold of the object and were making off with it. The three of them made after them in a dead sprint. Meanwhile Corunir downed a goblin with his bow and the four men in the middle made way toward the right flank. The troll had regained his courage after having reconsolidated with the goblins and was now making his way back toward the object. Amdir, and Eadrick were the first to meet the two goblins in combat. Quickly they killed him, and he dropped the object. They could see that it was a stone with a pale blue light that was very pretty to look upon. They were drawn toward the objects beauty, but were pulled away from it by the battle that surrounded them. Having been distracted by the stone, they were open to assault whilst the rest of the rangers were still out of range. Just then the troll came barreling down the mountain in a rage.RIGHT before he made contact, Amdir charged the troll head on. Seeing him charge the troll, the two brothers forgot all fear and followed into the combat with him. In a major feat of prowess and strength, Amdir parried the blows of the troll and with his sword, and cleaved off its head. For an instant the battle stopped as the goblins were paralyzed in fear, and the rangers stopped in surprise. The interlude was short and both companies continued on with their bloody business. The three began fighting again and slew another goblin. Finally the other goblins and rangers met In combat, but at this point the goblins were severely weakened and stood no chance against the rangers. Quickly they fell one by one until they either fell or fled the field of battle. Strewn across the battle field were many dead goblins along with the severed head of the troll. However not all of the goblins died. One goblin lay in a pool of his own blood whimpering and crying. Tarandir strode up to the pitiful creature and asked its name. It replied “Me Gitnick. You kill my pet. You will die!” Tarandir put his sword to the creature’s throat. In recognition of the gesture, it put its arms up to indicate surrender. He asked the creature “where are the orcs coming from”. Gitnick replied “me only tell if you no kill”. He replied back “I shall keep my word, only if you keep yours”. Gitnick was reluctant at first, but said “me no like orcs, they mean. Me show you where they come from”. Pendants of the star of Arnor were given ceremoniously to the newly minted rangers. While they might not be of Numenorean blood, they now have the responsibilities as if they did. Adenhad, Erik, and Eadwin were nervous, but displayed a sense of pride and accomplishment as well. They had risen above their simple station as farmers and now had a greater purpose to aspire to. One by one each of the rangers at the ruined tower paid them their due complements. Brognir’s statement of support was the most impassioned, and brotherly. This was a quick turnaround from before when he cursed their presence and looked upon them with disdain. Tarandir and Corunir thanked them together, happy to see their deeds recognized and carry on with them in their travels. The company looked at each other warily, not entirely prepared for receiving such an important task. Corunir reacted a bit differently; he wasn’t as concerned with the mission, as he was with greeting his childhood friend Amdir. It was then as Corunir’s mind turned to his old friend that Amdir stepped into the room. They embraced each other as brothers would, and many smiles were shared between them. Corunir introduced his old friend to the company who were all happy to have another among them who could help in the days to come. After having received their orders and greeted Amdir they headed outside toward one of the many campfires. They helped themselves to the food that had been provided and began discussing the many paths and means to Mirkwood. The conversation was short as the way was straight. They decided that they should make straight toward Rivendell and through the Red Horn Gate just as Garafon suggested. After the decision had been made, each of them was free to do as they pleased for the remainder of the day, but they had to be ready to leave the next day to pursue their journey. The day of leisure passed quickly and turned into night and then day again. The company awoke before first light, gathered their provisions and were off, but not before each of them said their goodbyes. They were now back in the forests of the Trollshaws and it would be several more days before they reached Rivendell. There were no roads between Rivendell and the Ranger’s Tower, but it tarried them not. They were used to the rugged back countries and forests, for that is where a ranger is truly at home. The first few days were uneventful, but good progress was made. On the fourth night, a small glow could be seen from the hill on which they made their camp, but it was several miles away and could barely be seen. The next day they made their way toward the location of the fiery glow. As they made their way, an unspoken wave of apprehension spread amongst the company and they proceeded quietly and cautiously. As the camp came into view, their apprehension was justified as it was occupied by a group of larger and more brutish orcs. The orcs were oblivious to the rangers presence until the rangers let off their first shots. From there each side attempted to maneuver around the other and each split into two groups. This maneuvering lasted a while, until Amdir and the two brothers cornered two orc archers and slew them. With the enemies’ archers having been slain, the rangers were free to advance. Corunir and Tarandir advanced whilst loosing their arrows. Corunir got one orc between the eyes and he fell dead. Now the orcs had suffered gravely and were outnumbered. The rangers and the orcs then closed ranks and a swift combat ensued with all of the orcs having fallen. The rangers did suffer a scare in the melee as Brognir fell after one of the brutes smacked him across the arm with his sword, but his armor saved him. The company searched the camp and found nothing of use. Tarandir told the others that the orcs they faced were called Uruk Hai, a stronger and more deadly breed that had recently appeared. Afterward they continued on toward Rivendell with more experience and knowledge. The next night they heard howls and unearthly cries in the distance, but rising up to meet the discordant cacophony was a loud thundering cry that seemed to shake the trees. The loud voice said “SHUD UP STOOPID WOOLVES! I’M TRYNA KOOK ME SOME ROAST GOAT!” When the voice had stopped, and the echoes had sounded off the hills, a deafening silence followed. The calling and baying of the hounds ceased, and the rangers were free to sleep. The rangers were awoken again by another series of shouting in the morning. “COME OUT TO PLAY ME WANTS MEATS. COME OUT TO PLAY ME WANTS SHEEPS!” after the shouting the howls began again, except this time they were moving toward the shouting. Quickly the rangers tried to move toward the shouting as well to see what was going on. As they ran toward the location of the shouts, the howls got louder and louder. They burst through a bush and found a hill troll fighting a group of wargs and their riders. Tarandir told the others to wait. He wanted both sides to wear each other out before engaging. The fight continued and slowly but surely the troll began to weaken. Tarandir then indicated the group to advance. Corunir took a shot and slew a warg, but the wargs had wounded the troll too much and it fell. Before the rangers had a chance to engage them they fled. The group was disappointed that the troll got away, but was also thankful that they didn’t have to fight a troll. After the fight, they would have no more troubles on their way to Rivendell. Two days had passed since the company of rangers had met the beleaguered farmers. Since then snow had begun to fall from the high peaks of the Misty Mountains, dotting the landscape here and there with patches of white powder. The family was ill-prepared for the sudden cold as they fled from their homes and had little time to gather provisions. The children were whimpering and shaking in the cold, but the rangers were too preoccupied with observing the road, that they did not notice. Their father, Adenhad, one of the three surviving men, approached Tarandir to request additional warmth for his children. Corunir had overheard and suggested that they lend to them their sleeping blankets. Tarandir replied only with a smile, retrieved his blanket and handed it to the youngest child. Brognir was more reticent, and handed his blanket to the little ones with a grunt. After this he strode up toward Tarandir in order to converse with him. “I cannot wait to be rid of this burden. We should be hunting orcs, not tending to sheep”. Tarandir replied “These sheep are our charges and we are to protect them”. Brognir slunk back having realized his mistake and fell to the rear. A quite had fallen upon the company after Brognir had aired his grievances. In their silence they came upon a ruin of the once proud kingdom of Arnor and their quite had turned to contemplation. Among the overgrown statues and walls they were saddened by the loss of such beautiful craftsmanship, but were also emboldened in that they may yet be reclaimed. Despite the wish to camp in the ruins, they pressed on. Brognir was still in the back of the company recovering his pride, when he saw orcs moving toward him. There were about 9 of them coming from the ruins. Brognir shouted “Orcs! From the ruins! Move the little ones!” Brognir, was the first to advance and made clear to the 3 men to accompany him. He was attempting to draw the orcs into the woods, while Tarandir and Corunir covered the road. Just as Brognir made it into the woods, and the other two rangers got into position they saw the orcs. The first shots from Tarandir and Corunir failed to hit their mark, but the second had Tarandir fell an orc. Quickly the orcs began to return fire, but their poor marksmanship was made worse by the cover of trees. Now the orcs were trying to encircle the company, but they were wasting precious time. Another volley sprang forth from the duo, with Tarandir again felling another orc. In the woods swords and spears began to clash and Brognir brought down their slavish looking leader, who so foolishly led the charge. While the volleys of the rangers proved deadly, their aim was not deadly enough, for a single orc was still upon the road making his way toward the duo. Tarandir sprang forth from cover to charge the orc, while Adenhad distracted him. The distraction proved successful as Tarandir slew another orc. All the while, Corunir was still behind a tree keeping the orc archers from being effective. In the woods, the combat was still unfolding as orcs were making their way toward Brognir and the two brothers. One by one they came and thus the men were able to overwhelm them. In the melee the brothers both proved useful, each skewering an orc. With so many of their kin having been slain, the orc’s bloodlust turned into terror and they fled at the sight of their fallen comrades. But that is not what scared them the most. Tarandir had imprinted himself upon the minds of the orcs and they feared him above all else. What little orcs remained were now sure to spread terrifying stories of the rangers. Brognir wanted to chase them all down, but Tarandir knew that by letting them live he could now use his very presence as a weapon. After the chaos of the melee, Brognir was the first to go about searching for the family. Thankfully they were close at hand and found quickly. Brognir was relieved that they were ok, and had demonstrated to the company that he had corrected his way of thinking. Corunir was especially relieved at this turn of events as he had formed quite a bond with some of the children. That night the company camped alongside the road and the mood was now cheery and hopeful. After the combat Brognir now seemed to delight in the company of the 3 men, after all battle does tend to form strong bonds. The next day they left the borders of the Ettinmores and returned to the relative safety of the trollshaws. In the distance they could see the remnants of a tower standing high upon a hill above the tree tops. That was their destination. The tower like most of the ruins of Eriador was a remnant of Arnor, but this tower had been maintained by the rangers. When they passed over the small stone fence surrounding it, they were greeted by a lordly looking man in shining mail. With a smile he embraced Tarandir and the rest of the rangers. Then his expression quickly soured as the conversation transitioned toward more dire news. Eventually he addressed the 3 men and the women and children and offered them safe passage toward Bree to the west. Finally they were safe. 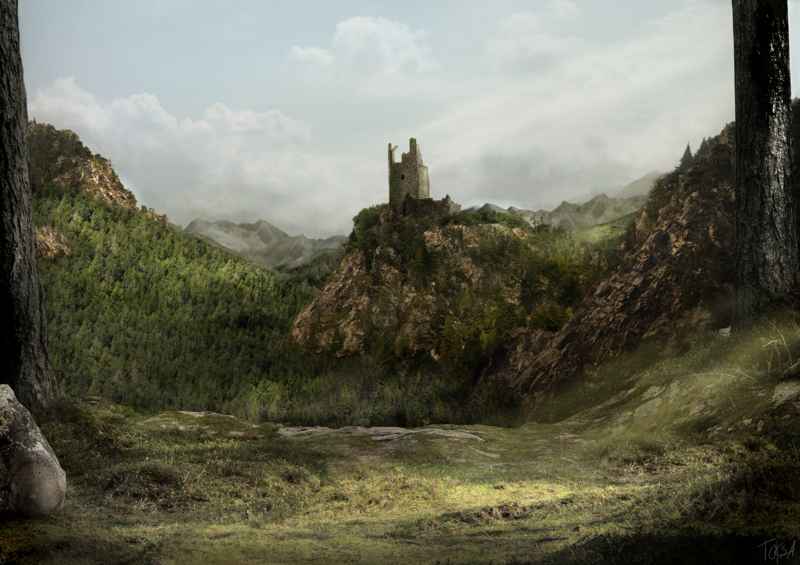 Surprisingly though, Adenhad, Eadwin, and Erik all declined to travel with the women and children, for they wished to protect their lands and yearned for the possibly reclaim it one day. This decision was most unexpected from Adenhad as he would be leaving his family behind to partake in the coming war. The lordly looking man was astonished as well and was pleased to hear the reasoning for their decision. In fact their reasoning was the same as that of a ranger. In acknowledgement of their deeds thus far and the stoutness of their hearts, the lordly man said “I Garafon, Ranger Captain of the Fallen Kingdom do declare you honorary rangers”.